Trisilgard™ provides an odorless, colorless and eco-friendly microbe shield that protects the surfaces you apply it on for weeks at a time. It inhibits the growth of single-cell microorganisms and provides antimicrobial protection against harmful odor-causing bacteria, yeast, mildew, and mold that come in contact with the surface immediately. 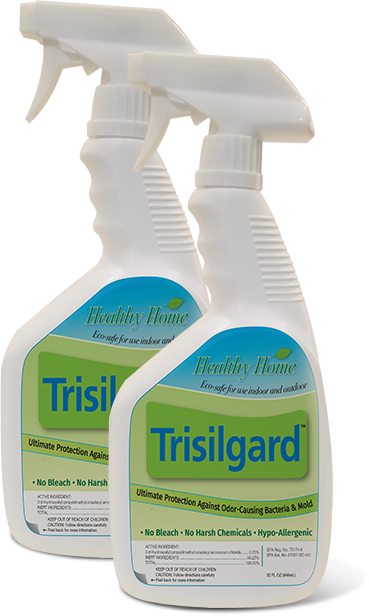 Trisilgard™ provides a very effective and durable microbe shield on almost any surface inside and outside your home. 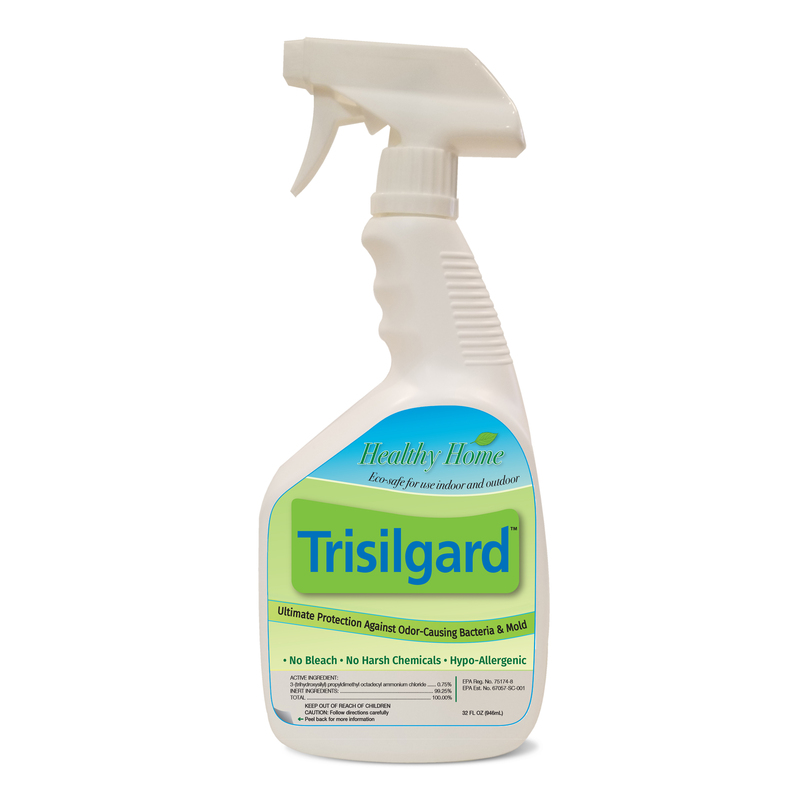 Simply apply Trisilgard™ after cleaning to bathrooms, kitchens, playrooms, even clothes, and bedding, and your house will remain fresh, odor-causing bacteria and mold free and safe for a very long period of time. Trisilgard’s™ antimicrobial technology and compounds represent a new generation of antimicrobials. When Trisilgard™ contacts with the surface you apply it to, it changes the molecular structure of the surface adding its unique protective molecule on that surface. This molecule acts like a shield made of electrically charged swords that attract the microbes to it and kills them. The reason this molecular shield lasts so long on your surface is because of the silicone base on the molecules, helping them attach to the surfaces and create a strong bond through a hydrolysis reaction allowing the molecules to remain on that surface for months. Eco-safe for indoor and outdoor use. No bleach or harsh chemicals. Kills odors at the source. Trisilgard’s unique water-based molecular structure allows it to be applied to both porous and non-porous interior and exterior surfaces. Inside: countertops, cabinets, exterior of appliances, interior walls, carpets, wood and tile floors, bathroom fixtures, clothing, bedding, and more. Outside: siding, decks, play equipment, sporting equipment, brick and concrete walls, roofing, and more. A SPECIAL OFFER FOR FACEBOOK FRIENDS! Trisilgard™ is an odorless, colorless and eco-friendly microbe shield that inhibits the growth of single-cell microorganisms and provides antimicrobial protection against harmful odor-causing bacteria, algae, yeast, mildew, mold, and viruses that come in contact with the surface for weeks at a time. Copyright 2018 SiShield Technologies. All rights reserved.